Although many of these options are ones you will be faced with, we will focus on just one parameter regarding the forecasting for the busyness of a potential associateship. Why is the determination of new patient counts important? The new patient flow in a prospective practice is all important as it directly affects an associate’s potential busyness. Consider a new patient to be one that is x-rayed, examined, and treatment planned. It is not an emergency patient! It is important to understand exactly how the new patient flow in a practice works. By inspecting the new patient flow, you will be able, in part, to get an idea of how much work will be available for a potential associateship. During your associateship, it is essential that you enter a practice that will put your abilities to good use, yet offer busyness to build speed and yield adequate income. No one is benefited when an associate enters a practice that has inadequate new patient flow. Inquiring about the new patient flow with your potential employer will provide you with valuable information. A practice with a high flow of new patients, related to its revenues, will often indicate a healthy practice. On the other hand, a high new patient flow, related to revenues, can also indicate less comprehensive dentistry in the practice. If a practice performs less comprehensive dentistry, such as very few crowns, no periodontal procedures, and a high number of composites, it takes more new patient flow to sustain a given revenue stream. Sometimes a practice may only have five or ten new patients flow per month. If the practice is performing comprehensive dentistry, such as a high number of crowns and bridges and periodontal treatment per patient, then the practice does not need as many new patients for a given production level. Yet this type of practice, barely busy enough for the host doctor, often has little potential for the associate. The relative busyness of the host provider indicates if the new patient flow is adequate or inadequate as discussed later in the article. How do I determine the practice’s New Patient Flow? With the incorporation of computer management systems in most offices, it is much easier to accurately determine a practice’s new patient flow. To determine the new patient flow, look at the Comprehensive Oral Evaluation (D0150) code counts. This code, if reported correctly by the staff, will disclose the practice’s new patient flow very accurately. The computer, if queried, will give an inaccurate count of new patients because emergency patient visits will also be counted in its new patient tabulation. 1. New child patient evaluations incorrectly reported under code D0120, the Periodic Oral Evaluation. This is often done in an attempt to keep the total fee of the child’s initial visit down, but is not the correct code to reflect new child patient visits. The Periodic Evaluation (D0120) code is only to be used for recall visits. It is a good idea to ask the doctor or the business staff how they report new patient child visits, so if this coding error is taking place, you will be able to accurately determine the new patient flow. 2. Reporting the Comprehensive Periodontal Evaluation (D0180) for new patient visits. If D0180 is used in this manner, include it in the new patient counts. However, D0150 is a broader code and is better fitted to report the new patient exam visit for the general practitioner. 3. Incorrect inclusion of the Limited Oral Evaluation, Problem Focused (D0140) code. Code D0140 should only be used to diagnose a specific problem or related complaint, commonly at an emergency visit. It is easy to see that these common miscoding errors can contribute to the miscalculation of the new patient flow. With these three common coding errors rectified, if applicable, the calculated new patient flow of your prospective practice will be accurate. Now that I have calculated the true New Patient Flow of the practice, how do I know if it is adequate for an associateship? As a general rule, most practices need at least one new, treatment planned patient per three thousand dollars ($3,000) of practice revenue. This new patient ratio of $3,000 does not reflect that $3,000 of work is done on the new patient. Rather, the $3,000 new patient cash flow ratio comes from three patient revenue streams: emergency, hygiene, and new patients. However, this ratio does not apply straight across the board. In practices that produce above average comprehensive dentistry, a lower new patient count may sustain busyness. For example, a practice may be producing $600,000, with a new patient flow of only 150 new patients per year. By dividing the revenues by 150 new patients per year, there would be a higher $4,000 new patient ratio. Now compare this to a practice that is producing $600,000 but only has a new patient flow of 75 per month.This is an $8,000 revenue per new patient ratio. Does this mean that the practice with only 75 new patients per month is less healthy than the practice with 150? To determine whether the practice with the low new patient count is healthy, at least for the host doctor, you will need to inquire into the busyness of the host. If the host’s schedule is booked “solid” only a few days, then more patients are needed for busyness. If the host’s schedule is booked 1 1/2 -2 weeks, then the host is in equilibrium with treatment demands. If the host is booked 4-8 weeks ahead, then the host cannot keep up with patient demand and excess production is available for the associate. If the practice produces comprehensive dentistry in conjunction with a comprehensive procedure mix, more revenue will be available per new patient ratio. The comprehensive practice is generally heavy on crown and bridge, with a crown to filling ratio of 1 to 4, or one crown or greater for every four composites. Because more treatment is rendered per patient in the comprehensive practice, less new patients in the door are required to keep the practice healthy and busy for a given revenue level. However, the comprehensive practice with less new patients per month can be hurt (downturn in the economy) much more by a small loss or reduction of new patient flow since the incoming new patient flow counts are so low. As discussed previously, a new patient revenue ratio of $2,500 or less, more than likely has good potential for at least a part time associate. This is particularly true if intraoral cameras and effective third party financing are introduced into a practice without them. I have a good idea of the New Patient Flow of the practice, but what other factors should I consider? It is important that you take the opportunity to further analyze the practice. Watch for red flag comments such as “you need to build your own practice” or that you “need to be waiting, available for emergencies since your schedule will be light”. The positive busyness of the host doctor plus a very strong hygiene department patient flow are strong predictors for creating associate busyness. If the host is booked a solid six weeks ahead, and has two full time hygienists, then this means the host has work to be done that cannot be produced, allowing this backlog to be shifted to the associate’s production. This begs the question, how much is “excess” and is left for someone else to produce? Is it $50,000, $100,000, or a $200,000 per year potential? If procedures are referred out of the practice, and the associate is trained for some of them, then this production will also be available to the associate. MARKETING. In areas of need, marketing can dramatically increase new patient flow. PART-TIME or FULL-TIME. Consider the number of days per week the associate will work and the relative speed of the associate (how much they need to stay busy). If the associate starts out at one or two days, the workload can be assessed, and increased if needed. HYGEINE - DOCTOR RATIO. A final factor should also be considered and that is the hygiene to doctor ratio. For every $400,000 of doctor production, generally a full time hygienist (4-5 days) is required to “feed” the dentist. Adding associate production hours without adequate hygiene department “feed” will create busyness problems. 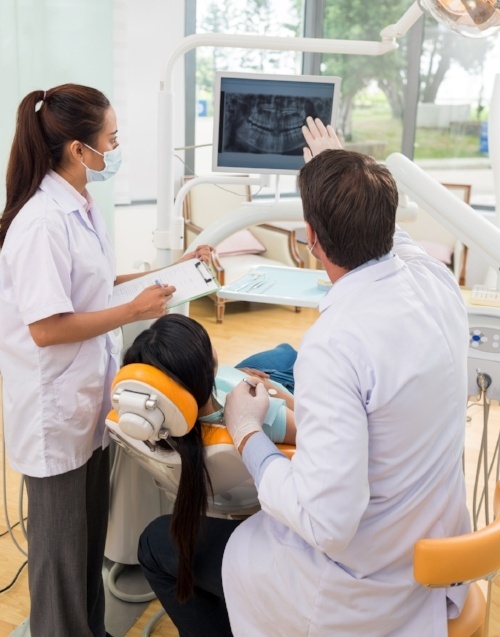 When taking your first steps outside of dental school, into the real world of dental practice, consider these factors for the success of your associateship. CO-AUTHOR. Dr. Charles Blair is a contributing editor of Dental Economics Magazine and President of Dr. Charles Blair & Associates, Inc. in Mt. Holly, North Carolina. His Revenue Enhancement Program includes fee consulting, clinical procedure protocols analysis, and proper insurance coding guidance, which averages over $85,000 increase in net profits annually per practice consulted. Thousands of offices have gone through the program. Call (704) 827-6295 or contact Dr. Blair by email at charles@drcharlesblair.com for further information on this unique program and his insurance coding manual, “Coding With Confidence: The Go-To Guide for CDT- 2007/2008.